Welcome Technical information on electric bicycles and e-bike kits Motor types. Which one is right for you? You might don't know, but there are many ways you can electrify your bicycle. And there are different types of e-bikes you can purchase. How they differ? Which will suit your needs? Here is a comparison of the different electric bike motor systems to help you determine which configuration is best for you. Shortly, main types are hub motors, mid-drives, all-in-one wheel motors and friction drive motors. Let’s discuss them one by one. Hub motors are electric motors that are housed inside the hub of either the front or rear wheel. They are the most popular electrification option due to their simplicity. The kit includes wheel motor, battery (usually rack or frame), controller and display. There are gear and gearless (direct-drive) hub motors. Gearless motors usually have regenerative braking function that charges a battery when braking and also provides good bicycle braking; as a result, you increase the lifespan of your original brakes. 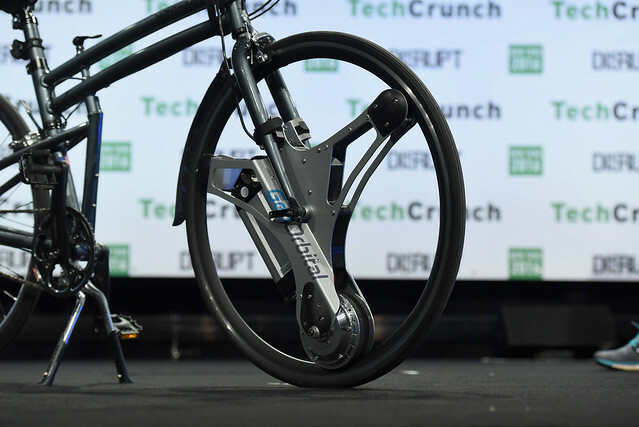 In general, a front hub motor pulls you and it creates an all wheel drive e-bike. It creates an all wheel drive bike because the motor drives the front wheel and you can power the rear wheel with your pedal power. This can be advantageous for riding in snow or sand. Any bike drivetrain (gears) can be used: traditional gears with cogs, chain, and derailleurs or hub gears with a chain or belt drive. Front hub motors can provide for a more balanced bike weight distribution if the battery is mounted in the middle or back part of the bicycle. This helps when lifting the bike onto a car rack or carrying up stairs. You can still use bicycle coaster brakes. Front hub motors need a sturdy fork, especially for the higher powered motors. If the hub motor is very heavy it may affect steering. In general, rear hub motors push you. Rear drive is natural to all bicycle riders. Rear hub motors are harder to install or remove than a front hub because the gears (chain, derailleur, etc.) need to be worked around. Bikes that have a rear hub motor with a rear rack battery are back heavy, and that can affect the handling. They can be hard to handle while lifting onto a car rack or carrying the bike up stairs. In general, a mid drive motor powers through the drivetrain (transmission) of the bike which enables the motor to help with long & steep climbs and power up to high speeds on flat roads. Removing the front or rear wheel is easy because there is no wires or hardware to remove (compared to hub motors). The bike can use almost any wheel type along with quick releases front and rear. Since the power is being transferred through the drivetrain of the bike there can be more wear applied to the drivetrain components (chain, cogs, derailleur, etc.). The higher power systems will add significantly more wear, and those parts may need to be replaced on a more frequent basis. Some mid drive systems can sense when you are going to shift the gears and they will reduce the power for a smoother shift. Some systems don't have these sensors, and that can lead to abrupt shifts when the motor is applying full power. A majority of mid drives have a single chainring which limits the gear range to a rear cog set or the gear range of an internally geared hub. 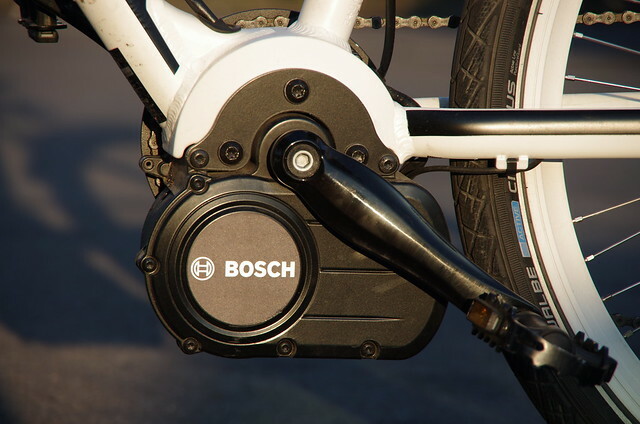 Most of the traditional mid drives systems are only available on complete e-bikes with particular frame mounts. There are not many retrofit mid drive kits to choose from right now, but it seems that there may be more on the horizon. This is somewhat a new technology. 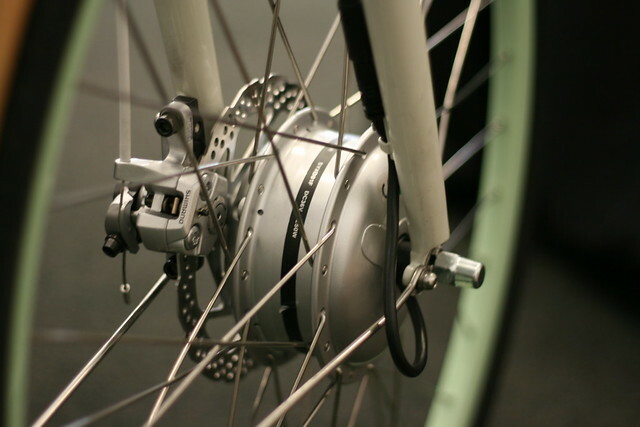 The difference between this type and hub motors is that the all-in-one electric bike wheels house everything in the hub or wheel: motor, battery, controller, etc. These systems come in either the front or rear wheel configuration. Here are some pros and cons for the all-in-one systems. In general, they are advertised as being easy to install or remove because it involves the replacement of either the front or rear wheel along with an installation of a few other components. Some of these systems have smartphone integration that provides a wide array of features: adjusting the settings, tracking rides, locking the wheel, etc. Repairing and replacing components of the system may be more difficult when compared to traditional electric bike kits. The motor may need to be sent back to the company for service. Some all-in-one systems have just one size of a battery pack. Meanwhile, traditional hub kits have the option to increase the battery capacity for more range. In general, these motors have a roller that sits on the bike wheel and uses friction to transfer the power from the roller wheel to the bike wheel. These tend to be relatively simple systems that may have the advantage of fewer things to go wrong. So, which one to choose for you? Well, you can always test-drive every option and find what suits you more. Normally, hub motors are safest option to start with, especially if you need classic city e-bike: they are easy to install, relatively cheap, easy to repair since you can replace only required part and provide excellent technical characteristics for the price. Mid drives are recommended to those who cycle a lot on a hilly terrain. All-in-one systems are neat looking and will suit to those who value the appearance more than price. Friction drives can also be a good option, especially if they provide a quick installation and removal so that you can switch the system between bikes instantly.